KUALA LUMPUR: The famous Putra Indoor Stadium here has been rebranded as Axiata Arena in an effort towards building a sporting nation. Youth and Sports Minister Khairy Jamaluddin said this followed a 10 year agreement worth RM55 million between Malaysia Stadium Corporation (MSC) and Axiata Group Bhd. 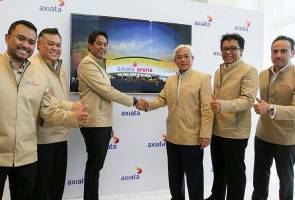 "We are working on the fine details of the agreement and hope that the stadium will have an impact in promoting Kuala Lumpur as a sports hub in the region and also as a centre for entertainment and cultural events," he said during the soft launch of Axiata Arena at Axiata Tower here, today. Khairy said Axiata Arena will be the landmark for the redevelopment of Bukit Jalil Sports Complex which will be known as KL Sport City by July. "The arena will be used as the main stadium for various sporting events in the 29th SEA Games and 9th ASEAN Para Games this August." MSC will be responsible for maintenance of the stadium while other upgrades will be under the purview of Axiata as stated by a clause in the agreement. Khairy also said the ministry was looking forward to have more corporate partnership in developing and upgrading other stadiums nationwide. "We look forward to have other stadiums partner with corporate companies to upgrade the facilities and add commercial value." On the same note, Axiata Group President and Chief Executive Officer, Tan Sri Jamaludin Ibrahim thanked the Ministry of Youth and Sports for allowing the telco giant to be the first corporate company to sign such an agreement. "This is the first deal of its kind and we are committed to support the government initiative in this particular field. "Axiata has been part of the sporting community for some time and we hope with this effort, every Malaysian will benefit from it," he said. Upon completion, the stadium will be on the same par as Staples Centre in Los Angeles, 02 Arena in London and Mercedes Benz Arena in Shanghai as a world class sporting and entertainment venue. Pilihan AWANI 19 Dis: Peluang untuk ubah UMNO?